Let’s do some sketching! 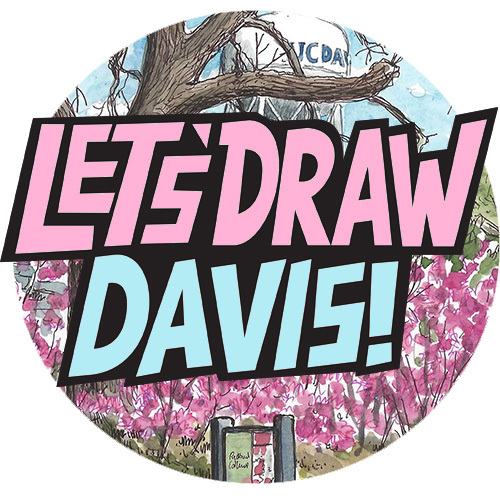 The November ‘Let’s draw Davis!’ sketchcrawl ended up not happening (due to all the unhealthy air) but it’s time for another sketch-crawl meet-up, this time at the colorful Davis Farmer’s Market. Just a short one this time, 10:30-1pm, but enough to get a few bits of sketching in. We’ll meet up at the benches by the Carousel in Central Park (located between B and C Streets, the Carousel is about in the middle of the park, just past the market), and then do some sketching around the market and the park, before meeting up again at B and 3rd St, at the entrance to the Davis Bicycling Hall of Fame at 1pm (which provides a nice shelter if it rains). At the end we look at each other’s sketchbooks and, if you like, share our sketching methods. As always the sketchcrawl is FREE and open to anyone who likes to sketch, and meet others who also like urban sketching. All you need is something to draw with and something to draw on.